San Diego Comic-Con has become a mecca of popular culture and this year’s convention is proving no different. The internet has been sent into overdrive as fandoms gorge over glimpses of hotly-anticipated TV and film releases, while also celebrating cult classics. Here’s a quick run-down of the biggest news so far. When the Doctor gets regenerated, it always marks the beginning of a big change in the series – a whole new look, new assistant and this time, a whole new gender. We all know that Jodie Whittaker is taking over and Comic-Con fans were treated to a glimpse of the first female Doctor at a time when gender in film and television is a huge talking point. 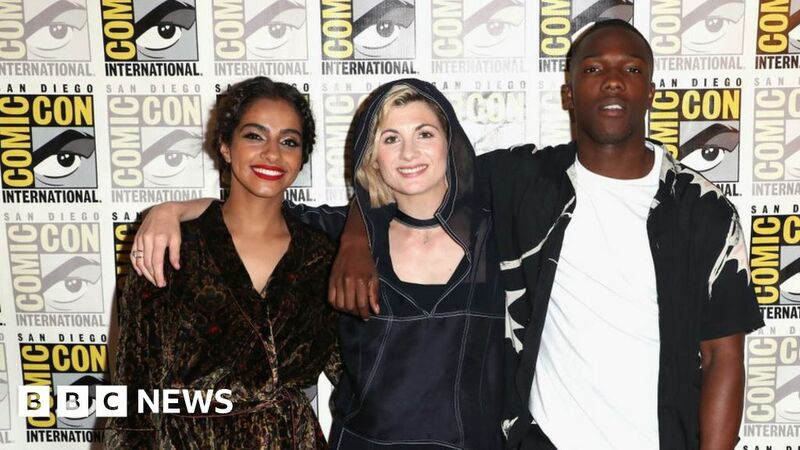 Showrunner Chris Chibnall, who was part of a panel made up of Whittaker, her companions Mandip Gill and Tosin Cole, plus exec producer Matt Strevens, said this series is different as it features writers of colour for the first time, along with female guest writers, directors and editors. The trailer, which was shown to audiences, also appeared to confirm rumours that one episode will explore the civil rights movement in the United States. One shot shows the Doctor and her friends in front of a building which bears more than a strong resemblance to the Lorraine Motel in Memphis, Tennessee where Martin Luther King was shot dead in 1968. In the background the words ‘Montgomery Motor Freight’ can just be made out. The city of Montgomery is where Rosa Parkes refused to give up her seat on a bus to a white passenger and was arrested. It sparked huge protests involving Parkes and a young Martin Luther King. Montgomery later became known as home the Civil Rights movement. The crowd not only got to see the new trailer, but also the Doctor’s new sonic screwdriver. Whittaker revealed it to fans on stage and it appeared to have had quite the makeover, although the screwdriver still had its iconic sound, so there’s no need to panic. 2. Breaking Bad lives on! No, you’re not tripping, it really has been 10 years since Breaking Bad hit screens. The tale of Walter White’s transformation from cancer-riddled chemistry teacher to drug overlord – in partnership with his former student Jesse Pinkman – captured imaginations worldwide. It also turned lead actors Bryan Cranston and Aaron Paul into superstars. Despite the show’s five-season run ending in 2013, Paul admitted he still misses playing the lovable rogue – but fortunately he’s found a long-lasting (and very cute) way for his legacy to live on. The actor proudly presented his five-month old daughter, Story, who stole the show dressed in the yellow hazmat suit and protective mask that made her dad famous. The pair joined creator and showrunner Vince Gilligan, Bryan Cranston (Walter White), Anna Gunn (Skylar White), Dean Norris (Hank Schrader), Betsy Brandt (Marie Schrader), RJ Mitte (Walt Jr), Bob Odenkirk (Saul Goodman) and Giancarlo Esposito (Gus Fring) to celebrate its impact…. and tease the future. Asked when we might next see Walter and Jesse back on screen, Gilligan said it would be “sorely remiss” if the pair did not make an appearance on prequel show Better Call Saul. And as for a Pinkman/White spin-off? “Anything’s possible,” he said. The rapturous applause that met the Brooklyn Nine-Nine cast proved just why NBC saved the dropped Fox show amid a massive fan campaign. The Emmy and Golden Globe-winning sitcom has tackled important topics – including police profiling and bisexual representation. The group discussed Beatriz’s character, detective Rosa Diaz, coming out as bisexual – a watershed moment on US network TV. “Dan Goor was interested in exploring the idea that Rosa might be queer… but he asked me what I thought about it,” Diaz said. It director Andy Muschietti was unable to attend Comic-Con because he is currently filming It: Chapter Two in Toronto. It’s got an all star cast behind it, including Jessica Chastain, James McAvoy and Bill Hader and is set 27 years after the first film, for reasons we won’t spoil for anyone who hasn’t seen the first film. A couple of teasers were released though, including a picture of young Beverly (Sophia Lillis) alongside grown-up Beverly (Chastain). Despite the film only beginning in production for a couple of weeks, clips of the adult cast’s first table read were shown and a script read for the child actors. It sees the characters reunited in a Chinese restaurant for the first time since they made a pact in the summer of 1989. Fans of Stephen King’s novel have a while to wait for the film though, which isn’t being released until September 2019. The cast and executive producers of The CW network’s Charmed reboot sat down at Comic-Con to discuss the show, particularly how closely it will follow the original. Fans were shown the pilot episode before the Q&A, which showed lots of references to the original show. The original show, which ran from 1998 to 2006, saw three sisters realise they were witches and the same premise exists in the reboot, except they have some more modern problems to deal with. Another exec producer, Jessica O’Toole teased fans about the demons the Charmed sisters will come up against, joking about a demon that had the ability to possess your Fitbit, which we all know would be utterly terrifying. The show will star Madeleine Mantock, Melonie Diaz and Sarah Jeffery as the sisters and is set for release in October.